The HP P4015tn includes 128 MB RAM, an HP JetDirect card for connecting to a network, a 100-sheet manual feed input tray, and two 500-sheet cassette trays. Also includes our long life fuser and metal fuser drive gear. Now with PrinterTechs metal fuser drive gear! 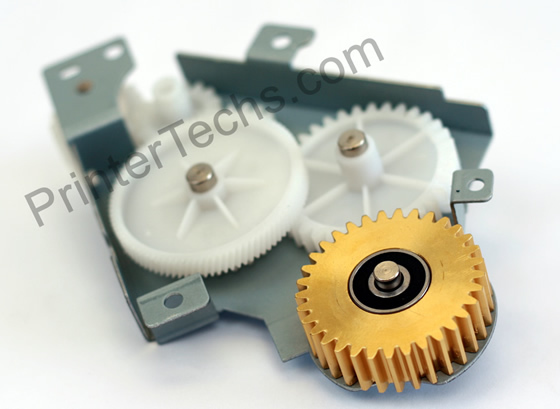 Similar to our popular metal swing plate gear in the HP 42x0 and 43X0 series printers, the metal gear we manufacture for the P4015 is an improvement on the plastic HP gear. Our gear is solid brass with two bearings which greatly improves the life of the fuser gear drive assembly and reduces gear noise. This is a PrinterTechs exclusive part that we manufacture for this printer. The LaserJet P4015 series is one of HP's fastest mid-sized business-class printers. High-capacity toner cartridges are available for this P4015n model, so the cost of toner alone makes a refurbished P4015n less expensive to operate than most of the smaller new laser printers.. These speedy printers are ideal for workgroup printing in medium-to-high volume. Our printers include PrinterTechs-exclusive upgraded Long Life fusers, which have been tested to last over 500,000 pages! When shopping for printers people usually forget to look at the cost of consumables (toner, maintenance kit, fuser, etc). 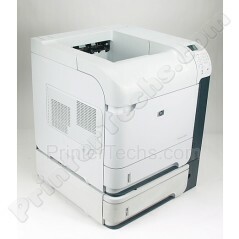 Printer manufacturers like to sell small, "home-office" printers at low prices. The up-front cost makes the printer look like a good deal, but the cheap printers are simply a vehicle to sell you more toner, ink, or service. The total cost of ownership should be considered. In many cases that "good deal" turns into a headache when you find yourself constantly buying and replacing the small-capacity toner cartridges and other consumable parts. Here is a video from PrinterTechs explaining our exclusive 500,000 page Long Life fuser! We replace the feed rollers, pick rollers, and separation pads. We don’t use cheap low quality parts. Only the best parts which we have tested. ALL solenoids for Trays 1 and 2 are inspected and repaired. This extra step it critical. As the dampening material on the solenoids wears away the adhesive backing eventually causes the solenoids to stick which results in paper jams. We use the best transfer rollers available, and this isn’t always a genuine HP part! Yes, we can tell the difference between good and bad transfer rollers. Out tests have shown that many of the OEM (genuine HP) transfer rollers print too light. This is a recent problem with the OEM manufacturer, but don’t worry, we have an excellent aftermarket transfer roller that doesn’t have this problem. Laser scanner mirrors are cleaned to prevent light print caused by dirty scanner mirrors & lenses. Plastic exterior panels that have discolored are painted with a special paint designed for plastics. This ensures the printer looks like new. 16.5" x 17.7" x 21.5"